Rugged, wild and raw. Vertical rock faces, cliffs, natural rock arches, caves, cavities and rocky outcrops and assemblages. It was the side of Boracay Island off Caticlan that I wasn’t familiar with. I woke as early as a quarter to five o’clock, A.M. as we were to meet at exactly five infront of Boracay Mandarin hotel. With three others from Iloilo media and two from Smart, our host, we walked to Station 1 where we will board the pumpboat. The sun hasn’t broken out yet from the horizon but the sky is turning pink, men were cleaning the sand and a few people were running at the shoreline. The engine roared, the pumpboat moved forward, past the sands of Stations 1-3, passing the low structures as well as the anchored yachts and boats near Asya resort in Station 3. Suddenly, the scene, from white sandy beach gave way to a rocky shoreline to cliff faces. I was amazed. We rounded off the southern part of the island. There were low but still interesting rock formations. Buildings of Boracay’s jetty came into view. At that early time, there were already boats bringing visitors to and from the island. As the sun has already risen from the horizon, beautiful yellow rays emanated, a golden sunrise. But just as we approached Bulabog Beach, the waves started to get stronger. Sea water splashed from time to time. Our pumpboat swaying lightly at first but as we progressed, it just became stronger. I was calm but from time to time blurted out whoas when the boat just tilted scarily. Our two young boatmen were quite calm whereas me and my companions were quite scared. I said to myself, nothing to be alarmed at, really. I’ve been to this before, in Palaui and Babuyan Channel and much stronger. Despite the waves, there were fishermen with their small bancas just going about their fishing. The flatness of Bulabog Beach gave way to a rugged hill, then a cliff, then that natural arch. As we rounded the northeastern part, the waves subsided, the swaying ebbed. Lo and behold, a beautiful white strip of sand with pristine waters and no structures loomed before us. This was Puka Beach where we stayed for an hour. I wasn’t able to resist it but I just ran into the water after a few minutes of shooting it. 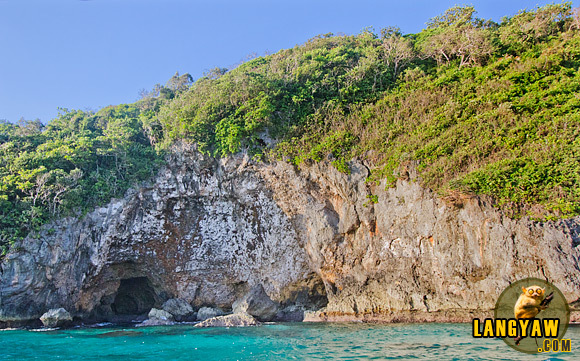 Rounding off the northwestern side, just after Puka Beach were a series of rocky cliffs but this time, lower than the other side. Slowly, the hotels and other structures of development in Boracay came into view. After a few minutes, we were back again in Station 1 where we alighted. 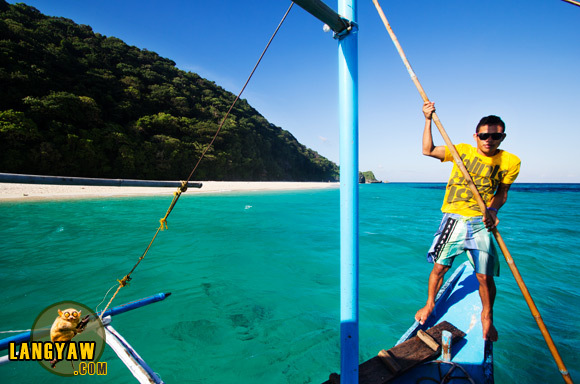 Hiring a pumpboat to go around Boracay or even island hopping is a good activity as it gives you an opportunity to see a different facet of the island, its wild, rugged and raw side. Far from the maddening crowds, far from the many structures. Doing this, you’ll come to appreciate this island better. Thanx to Smart for the media tour. There are several pumpboats available for rent. You can arrange it with your hotel/resort or ask around at the white beach in Stations 1-3. As for our rental, our host was able to get it for a discounted rate of just P2,500. expensive talaga d’yan kaya siguro hindi pa ako nakakarating d’yan he-he. pero sulit nga ang boating kahit worth P2.5k. i agree. mukha ngang carved eye yung isang side ng island. Wow! The photos remind me of the Boracay island hopping my wife and I experienced during our honeymoon in 2006.